Zomato Reaches 1 Million Orders Per Month Milestone! India’s largest restaurant search platform, Zomato, launched the much awaited delivery service approximately a year back. Despite other similar services like FoodPanda in the fray, the company has managed to do relatively quite well. Recently, the company announced that they have now reached milestone of 1 Million orders in a month and has dedicated to its team in Turkey. Swiggy, a food-ordering service, crossed the 1 Million mark in April 2016 itself, after nearly two years of operations, but in lesser cities. This translates to a staggering 34,000 orders in a day, and thanks to five weekends in the month of July, the company could log 1 Million orders in a month. The company had been tracking the daily orders from the beginning of July and was aiming for the 7 digit figure. On 31st July, at 8:23 PM, the company crosses the million mark and added another 20,000 orders before midnight. The order chart did not show much undulation either, which means that the daily orders were quite close to the average order a day. So we cannot attribute a million orders to a single event either. Zomato’s average order value is approximately Rs. 480, which depends on whether the restaurant has its own delivery service or relies on Zomato’s resources for that. In case the restaurant has its own delivery, Zomato is not able to charge the delivery fee from the restaurants. The commission charged by Zomato is nearly 8.20%, and the net revenue(profit) for the company has improved from Rs. 21 to Rs. 29. However, this is only for the cases where the restaurant has its own delivery service. In case the restaurant has to depend upon Zomato, the revenues are still not very flattering. Zomato’s blog post also presses upon customer retention – which has improved over the last few months. While the company chose not to disclose the numbers, we could see from the post that the returning customers have been increasing, and well above the average mark now. 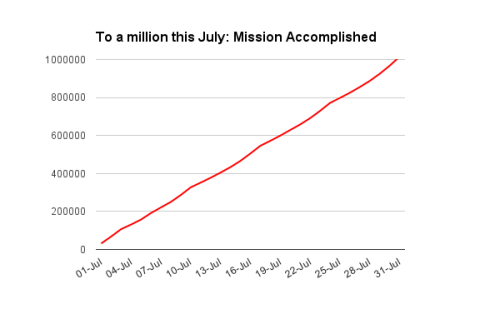 You cannot deny the fact that Zomato’s team has worked very hard to achieve the 1 Million mark in less than 15 months. Although the company has operations in a lot of cities, it takes great effort to reach this figure. Zomato has also been offering discounts on special occasions, as more and more restaurants join the platform. What remains to be seen is whether Zomato can beat the competition and emerge as the largest food delivery company in India. "Zomato Reaches 1 Million Orders Per Month Milestone; Customer Retention, Order Margins Improve", 5 out of 5 based on 1 ratings.